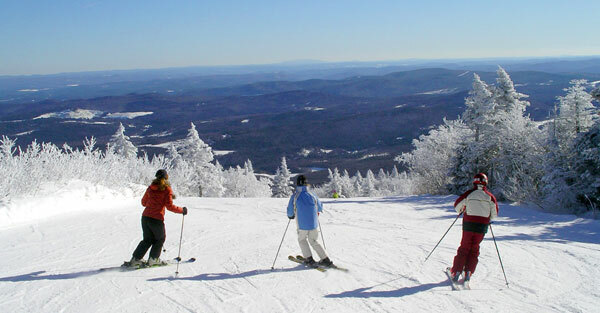 Bolton Valley Resort boasts great views of the Green Mountains, western lying Lake Champlain and NY’s Adirondacks as you ski its three peaks Wilderness, Vista, and Timberline. Bolton, under local ownership, has some of the best night skiing in Vermont on 10 trails and three lighted terrain parks. Only 30 minutes from Burlington, it’s a major draw for riders and skiers. Bolton in recent years has expanded its skiing terrain with new glades and a quad chair to the summit. A small, self-contained village round out the resort experience, with the popular James Moore Tavern for après ski in the Main Base Lodge, a Sports Center with swimming pool, the slopeside Bolton Valley Inn and condominiums. Bolton tends to be less crowded and affordable for families with a lively terrain park scene for teens. Bolton was the first Vermont ski area to debut a wind turbine. Bolton is owned by the DesLauriers family. 10 Night Skiing Trails Wed- Sat.